This is a Texas Star target. 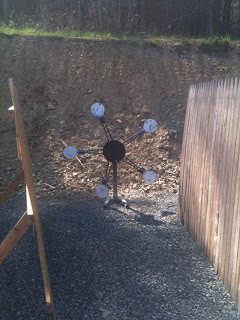 It is a common array at practical and steel shooting events. The 5 plates at the points of the star are the actual targets. Shoot a plate, it falls to the ground. I know, it sounds pretty simple. Until you factor in the axle. Yes, an axle, in the center of the star. With all the plates in place, the star is balanced. Knock one plate off, the balance is gone, and the star spins, eventually swinging back and forth like a pendulum until all the plates are down. It’s typically shot with pistols or shotguns, the latter being a little easier on the nerves if you have the right shot pattern. Although I have personally never seen it, I suppose you could use rifles on it, if the distance was far enough, and the steel was rated for rifle rounds, although the very thought of trying to clear this thing with a rifle, at distance, gives me nightmares. There are some wicked variations of the star. I’ve seen paper targets in place of the steel, with weights added to keep the star in constant motion. Adding strategically-placed no-shoot targets (the ones you don’t want to put holes in), anywhere near the star tends to result in no-shoots with a lot of holes in them. Even better: let’s put 2 stars together on the same axle. We’ll put paper or steel targets on one star, and no-shoots on the other. Then we’ll make them spin in opposite directions! Good grief, who thinks of this stuff? There are some “tricks” to clearing the star. Start at the top, work your way down. This keeps the center of gravity near the bottom, which limits the swinging. It also helps to pick a spot and wait for the plate. When it passes, hose it. A good place to hold your sight is the point where the plates pause to change direction. This works well, unless a devious match director has hidden that magical spot behind a steel wall, or a no-shoot. Yes, it happens. I don’t recommend chasing the moving plates with bullets. That’s a surefire way to burn up rounds. The crowd will get a good laugh, but in the end you may be left standing there with an empty gun, as those little plates mock you, merrily swinging along, untouched. “Ok, but bad guys don’t move like that.” I’ve heard folks say that the star doesn’t represent any sort of “real world” target, whatever that is. I view any challenge on the range as something that will make me a better shooter. Hopefully none of us ever have to use our shooting skills off the range, but if we do, experience with targets like the star might just give us the edge we need to get home that day. I really don’t know why it’s called a Texas Star. It is a big star, after all, and Texas is big on stars. Maybe its origins can be traced to the Lone Star State? Sometimes I want to send it back to wherever it came from, but deep down I’m glad someone made this thing. It’s made me a better shooter. This post and its contents are the views and opinions of the author only, and do not necessarily represent those of Beretta.